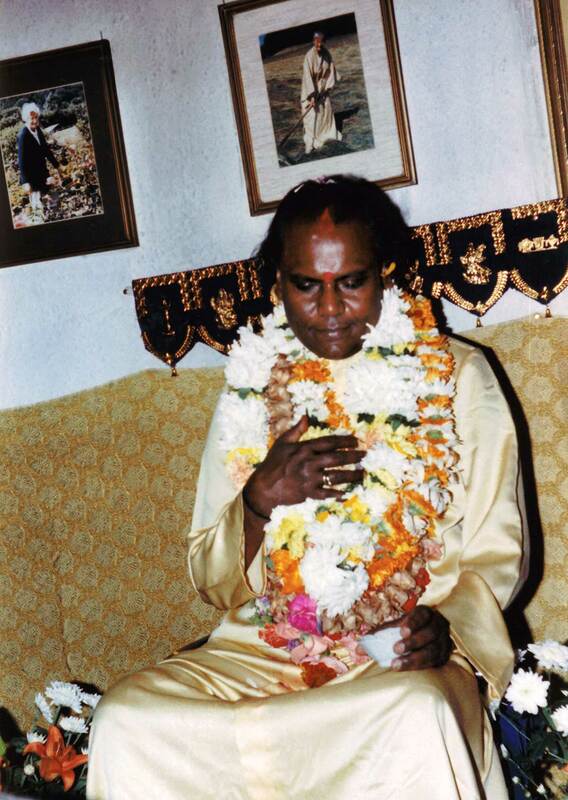 Justin Sparrow, one of Guruji’s earliest companions, shares his experiences of living alongside Guruji for many years. Justin was with Guru during the foundation of Skanda Vale, and during the arrival of the Divine Mother. Justin: Guru gave all of us such a wonderful experience of coming to know God. 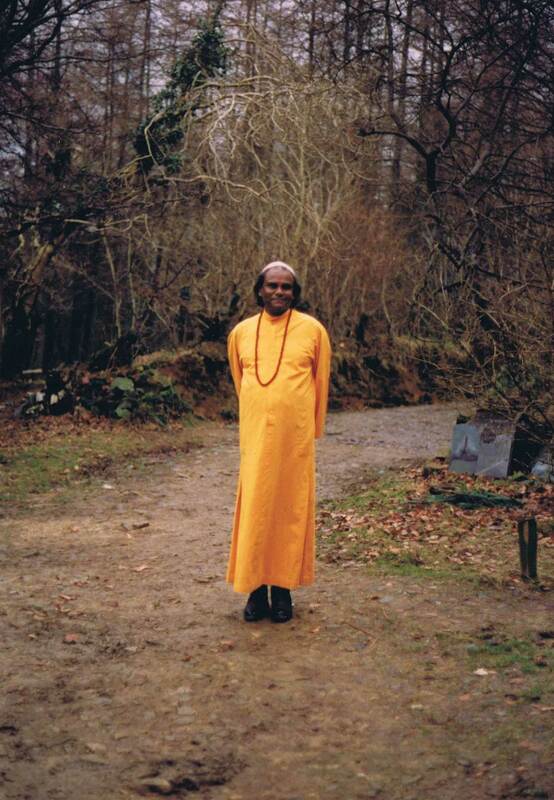 He gave us all the ingredients, all the methods, all the chances… everything in which grow in this knowledge and love and experience of the Divine. And then he would add that certain sort of magic dust on top! Because in those days we were such a small group, maybe five or six of us, and he’d teach us in the temple – yoga. And so after having a lovely meal, we’d then light the lamps, and he would chant, and then one by one give us personal instruction. He was in there, with you, taking you to that point… a million suns bursting in your head. So beautiful. So beautiful. 45, 50 years later… still trying! I’ve had grace in dribs and drabs. It’s so lovely. But he really knew how far to take you, and where to stop. He was so concerned, all the way through his life here, not to make people dependent on him. Which is why Skanda Vale is so successful, because with Guru’s demise there wasn’t barely a ripple. Things carried on so beautifully. Quite often I would take my mattress and drag it from my little room, the other side of the shrine, across the passage and put it down by Guru’s bed. He had a lovely shrine on the other side of his bed, and I’d always sit with him in the evenings and chant. I’d often fall asleep! I was so tired by then; it was way past midnight when Guru would start chanting, so occasionally I’d get an elbow in my ribs. When you’re falling asleep, and you’re trying to take part in the chanting… it’s very annoying for the other person when your chant starts to get slower and slower – you’re out of rhythm, and out of time, and you’re in the wrong place. So I’d get this elbow in my ribs “Either stay awake or shut up, but don’t chant out of time!” [laughs] Too sweet! So then I’d collapse onto my mattress. And another pillow would fly, but there was nobody in the room as far as I could see – just his shrine with lots of lamps. Next night, same story. This went on for quite a while, and Guru was clearly getting quite stressed that whoever was visiting him wasn’t getting the message, and wasn’t obeying the rather firm and fruity language! I won’t put on record quite what he said, because it’s not really printable. Guru was a master of fruity comments, it has to be said. Things developed anyway. He would describe what was happening – there was a lot of hair, and bulging eyes, and blood and weapons… and goodness knows what. And without being given the OK to appear, this creature kept coming back. He knew it was a female form; I think he rather feared it might have been half demonic and half divine, but he wasn’t sure. He wasn’t one to take chances. He was highly sceptical. He always encouraged us to be very sceptical. He would say “God has given you intelligence, rationality, the power to discriminate – jolly well use it. Don’t accept anything at face value.” And this was clearly what Guru was doing during this period of time. And then on one occasion (as he told me very shortly afterwards) this figure who looked like a hag; an awful ghastly figure with hair all over the place, suddenly transformed into the most beautiful vision of a lovely girl. Guru realised that it was actually the Divine Mother that he’d been shouting at and screaming at, and resisting and denying. And She clearly was not taking “No” for an answer. He wasn’t taking Her presence for granted, and so there was this battle of wills! But in the end She won, and he succumbed. She used to put Her knee in his back, into his backbone (I remember him describing it) and giving him the most incredible amount of energy. She would then fragment his body into a thousand pieces, and just scatter it into the sun. So he was completely bodiless. And then when She was ready, in Her good time, with a chuckle She’d then reassemble it (thankfully with all the bits in the right places) and he’d be given his body back again. I mean can you imagine me sleeping there? Bringing him his coffee in the morning, and he’d be telling me everything that had been happening to him during the night? I mean it was quite extraordinary. Night after night after night. Oh months! Months, and She would give him so much energy and shakti that the whole bed would shake. His body would be leaping off – actually he would leave the mattress. Sometimes it sounded as though he wasn’t breathing at all, which would concern me. It was alright while he was shaking, I wouldn’t worry too much, but then there was no breathing at all. Minutes would pass! And then I’d panic. You have to remember I was very young, and very inexperienced when it came to this kind of personal image… I’d had wonderful experiences of a sort of Universal Divinity – light and energy, power and colour, and all that. But not a personal image of the Divine who could change from beauty to hideous, and to everything in between so quickly. That to me was… it didn’t sound like fun, I have to say. And so I was worried, and felt I had to slightly protect Guru from what was going on, though I didn’t quite know how to. But I was concerned. I thought it wasn’t good for his heart – don’t forget Guru had had, not long before, quite a powerful heart attack, (or was it shortly after? I can’t quite remember.) I was concerned for his heart – what that would that would do to his system, the amount of jolting? It was a bit like electric shocks going into his body, it was very violent. I’m not sure it was that pleasant, but he accepted it. 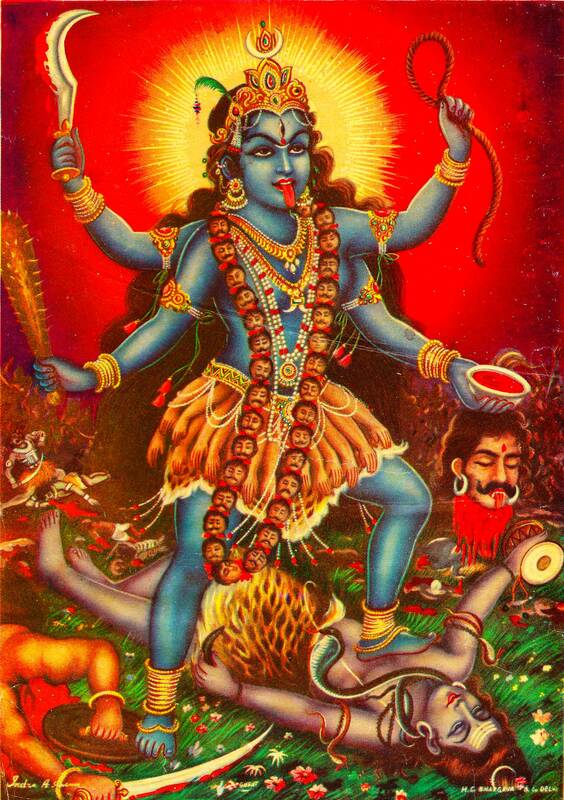 And around that time this beautiful murthi was then offered, (by Shiv I think) – She was then embraced with open arms. No question of being sent to a river for purification! OK – a lot of haldi and purifying was done, but She wasn’t dismissed. And that then began these lovely full moon pujas. So Mother had come to stay. And Subramanium was slowly, slowly (you could tell from his discourses in that period) was slowly being… not put aside… but just sort of made way for. Mother would then become more and more the central figure. And in fact She started to run Skanda Vale. He would bounce ideas off Her… concepts, thoughts. If you asked Guru a question, even then, he would say “Give me a minute and I’ll think about it.” He was reflecting the idea to Mother. And the answer would come very quickly… very quickly. Hadn’t he done that with Lord Murugan? He had, but… but somehow it appeared to us to be more Guru coming up with the answers. With Mother it was really a take over. It just seemed to be that She was really settling here. Like a mother chicken! She was getting Her feathers and wings out and putting everybody underneath, and taking care. With Lord Murugan… one never had quite the feeling… Skanda Vale was like the Vel of Skanda – the whole valley has that shape of a spear. But it was more seen as His energy, and His sort of power and His battle, and we were fighting various problems locally with farmers, and difficult rapport with neighbours and things… but with Mother it was like we’d disappeared under someone’s great duvet. It was a very different atmosphere. I can see it in the bhajans I used to sing. It was all “Subramanium, Subramanium!” It was almost verging on a battle cry sometimes, those Subramanium bhajans. And then with the Mother bhajans came a sweetness and a softness… or more of a sweetness. Not that there weren’t sweet bhajans sung – there were plenty of lovely Krishna bhajans. Because it was a very male community then. There was a sisterhood, but it was a bit of an added-on, a bolted on thing. And so with Mother the female principle, the whole female power came. It brought things back into balance actually. Now you have both. You have Subramanium down there, Mother up here and Vishnu in the middle. Talk about a Trinity! Magic! And his heart attack happened around that time too? I think actually his heart attack was just after Mother had arrived, because… it was somebody’s birthday… so we had a birthday cake. I think it was somebody called Greta Valentine. She used to live… there was a little chalet, I don’t know if you remember it? It then became an office, before the tent was put up, there was a little chalet on that piece of concrete there – that was Greta’s little house. So I think it was her birthday, and Gilla (who was famous for cakes) had made her a black forest gateau. With an awful lot of cream – cream inside, cream on top, and I think more cream added. It was a lot of cream. I’ll never forget those words. That night – the heart attack. That night! He didn’t realise what was happening to begin with. He had a terrible back ache, and then it developed into vomiting, and then the pain went round into his chest. It was two in the morning. All the cake came up, and everything else. Poor Guru. I got Guru to the car – still with a bucket because he was chucking up all the time. In a lot of pain. And I rammed it into gear. In those days it was just a field at the top here – there wasn’t a road out. Luckily it was summer time, so it was fairly dry, otherwise it was a problem to get across that field. I think I got to Glangwili in under 10 minutes. [It normally takes 20 minutes] It was a very fast journey. Fortunately Greta had made the call, and as we arrived there was a wonderful image of a very stout matron, with a wheelchair. And a couple of orderlies next to her, there under the canopy, just waiting. She opened the door, put Guru in the chair and felt his pulse I think. And she shouted something to the orderlies, and they pushed this chair at high speed, and I saw her running with a bunch of keys to a cupboard, a locked cupboard, and getting something out. And we were in the middle of the Shiva festival! We’d started the Shiva festival (or was it the very first day?) because I had to get back at 5am to do the first abishekam. I mean this was a night I’ll never forget. What a night! And so I had to leave Guru. There was nothing I could do anyway at this point. He’d been put under a lot of sedation – monitors and things everywhere, in intensive care. So I came back to do the puja, and the whole community was… well… word spreads quickly, particularly bad news, everybody knew. I guess in the night someone ran down. There was no telephone – I think we had an old army field telephone – you had to crank it, and we could communicate between here and down below what had happened. If I’m not mistaken, I think Swami Kamala had encouraged everyone to go into the temple and chant. I think there was a vigil going on. Anyway, we did the Shiva puja and then I rushed back in. And this went on… this slightly bipolar existence between the intensive care in Glangwili and the festival… for probably close to a week. But he clearly wasn’t going to die. It was touch and go, but after three days they thought he would be stable. He’d got peritonitis, a common byproduct of a heart attack. He was in a lot of pain around his heart area, but they could control that with drugs. Of course, while he was there, he had nothing from the temple with him. All his things he used to wear [malas and rosaries] had been taken off and given to me, on arrival I think, because in hospitals you’re not allowed to wear jewellery of any sort. But when I went to see him, he’d often be sat there with his eyes closed, telling his beads – imaginary beads, and he would chant. A lot of chanting. He would describe later how through chanting, during the whole period of the heart going completely crazy, his mind was able to somehow keep a limit on the amount of racing the heart was doing. He was able to slow it back, just to keep it within the bounds of OK. This was before he was given very powerful sedation. Very shortly afterwards, in intensive care, Divine Mother came to visit him. So on top of the heart attack he started to get all this shakti. Of course the hospital staff didn’t know what that was. And I remember She appeared in form of a bumblebee! He’d never heard of this before, but it turns out that this is one of Her manifestations; an enormous bee. A huge great buzzing bumblebee, coming straight through the big windows into intensive care, and just going ‘swoosh’ straight into his body! And then all this shakti. I think in a funny way that for him was wonderful reassurance that She hadn’t left him, She hadn’t abandoned him. She was still there, and this was just part of the drama of life. And at that time he was given the inspiration to start Skanda Vale Hospice? There was a man in the bed next to him who was very, very sick and clearly wasn’t expected to live. He was very frightened. Guru, as he always did, he befriended everybody. He took a lot of time and care and concern over this poor man. Nobody came to see him during the period Guru was there, which was probably a period of about a week. Guru just saw how there was such a need for a better place, and a better way, of caring for somebody who was terribly ill and was about to die. He didn’t need much this man, apart from somebody just to be with him. Somebody to hold his hand, to reassure him, to take away his fear. To be a companion during that transition from this birth to the next. It profoundly moved Guru to see how… it wasn’t a criticism of West Wales General Hospital… but just how in our society we weren’t spending enough time, effort and focus on the needs of people when they came to the end of this span of life. And because of this poor man… who did then die, about four days later he died in the night. He was always calling the nurses, and the nurses hadn’t time. They could come and administer, but they couldn’t really comfort him. They hadn’t the time, there just wasn’t the time to sit with him. He had no relatives. And that gave Guru… it saddened Guru a lot, and it gave him this thought. This sort of seed of resolve and determination that there had to be a better way to die, and that he would do something about it. He just thought this was something Skanda Vale could help with. After all, we cared for life, we looked after people anyway. But we certainly didn’t have facilities to care for terminally sick people. But that… often it was the case with Guru, he knew that the nuts and bolts would follow – that was a sort of detail. The main thing is to have a resolve to achieve something to begin with. And if that resolve is there, and that determination is there, then so long as your resolve is part of Divine Will, and it doesn’t go against Divine Will, then it will happen. Time wasn’t necessarily the issue. This was the starting point of the whole hospice concept. He made an incredibly fast recovery, to the extent that on the last day of the festival – full moon of Shiva festival, Guru Purnima – he discharged himself from hospital. He wasn’t in intensive care now, he was in one of those observation units, but he’d persuaded them that he was fine. I was quite cross, I said “Guru you’ve just come out of hospital, you’ve just had a heart attack! You promised them you’d stay in bed!” The deal was he’d spend a month in bed at home, and the doctor would come and visit. Not a bit of it! He put on his robes… there are photographs of him. Beautiful golden robes. Appears as though nothing has happened – sits on a chair like this. Huge puja (a pada puja) garland after garland, blessing everybody… and some devotees never knew. He didn’t breathe a word. So there was no surgery? He just healed himself? No surgery. No operation. His mind certainly… that first five or six hours… his mind absolutely kept his heart rate within the bounds of the possible. But it was so touch and go. And funnily enough that was the time when I developed such a love for Ganesh. We had a beautiful murthi of Ganesh on the shrine… and… I hadn’t got such a rapport with Mother at that stage. She was still too powerful and, in a way, almost too scary – because I could see what She was doing with Guru’s body, and I did not want that! And I’ve never lost, from that moment, this love for Ganesh. So for me that was also a huge step. And He would appear and became such a reality in my life. But I have to tell you, the staff in hospital absolutely loved him. They were very sad when he discharged himself. He had aftercare, so he would come back quite regularly and they loved it when he arrived. He was so polite, he was so sweet, he was so funny! He would just change the atmosphere in the rooms whenever he arrived. And they gave him the tip about something called Greek yogurt, which he’d never heard of before, and didn’t really think very much of yogurt prior to that. But Greek yogurt thankfully was quite a good substitute – it had the richness of cream, but without the calories, and all that high input! He was very matter of fact. I remember an experience I had during this period, lying on my mattress next to him. In the night my breathing had stopped. It was very odd. I was obviously having the most beautiful experience. I can’t quite remember now what it was. But at some point this beautiful image came… a sort of yogi figure, with long hair – matted, going up and up and up, like a river. And he said, in very nice English, this ancient ‘whoever he was’ said “Don’t you think it’s time you took a little breath?” In a very sort of casual way. And I said, “Oh yeah, OK” and then I woke up as though I’d been… you know that feeling when you’ve been down to the bottom of a swimming pool, and you’re trying to get something like a coin, and you can’t quite get it? And you finally grab it and then you have to kick the bottom of the pool to get your head up, because you’re desperate to breathe? It was that sort of feeling… [gasps] And I thought to myself “My gosh, what was all that about?” I’m convinced I was within a whisker of not having that breath. And he said, “You bloody fool! Imagine you dying – what am I going to tell the police?” That was all he said! I had a few near death experiences around Guru. There was one I remember… I was the only person allowed to use the chainsaw. I was considered responsible… big mistake! We were pruning a tree. I can still see the branch – a truncated branch, just over the end of what was a little pond, just here. Guru had asked for that branch to go. It was very low and it was coming across the road, it was taking an awful lot of light. And he wanted this tree coppiced in a way, but that particular branch had to go. So I said I would do it. Never a good idea to climb a tree with a chainsaw, but anyway I did. Up a ladder. And it wasn’t a difficult cut, but what I hadn’t seen was that the branch had a secondary branch, going up and back. There was a lot of foliage, going up and behind me. And I was stuck! This thing was on my head. The chainsaw was still ‘pop, pop, popping’. My finger was still on the trigger, released. But I mean… he must have been keeping such a careful eye. And something must have just inspired him. People will tell you… he used to just suddenly appear on building sites and things. Not expected… but suddenly Guru would be there, and whatever was about to happen, or could have, or might have… because we were using tractors, and we were often tired – because we’d been working long hours, doing puja and this, that and the other. His presence would just appear and then people’s minds would be focussed. And then what might have happened didn’t then happen. This was a classic example of that. His little face smiling through the branches! And your chin stuck on a chainsaw! With the thing still running! Just a tiny bead of blood there. He was here, there and everywhere. Looking after… coaching. Gosh he did a good job – a very good job. A wonderful job.